IP Speakers provide SIP connectivity for paging and emergency message notification applications.These IP Speakers are configured, controlled, managed and monitored via web browser. Optional microphone input provide hands-free two way intercom. The IP Speaker module comes with 3 control inputs and 1 contact output. 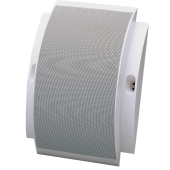 These IP speakers use common network audio codec: G.711, G.722, Wav, MP3 for USB interface for music and message playing. Perfect for Schools, Hospitals, Offices and Retail applications.